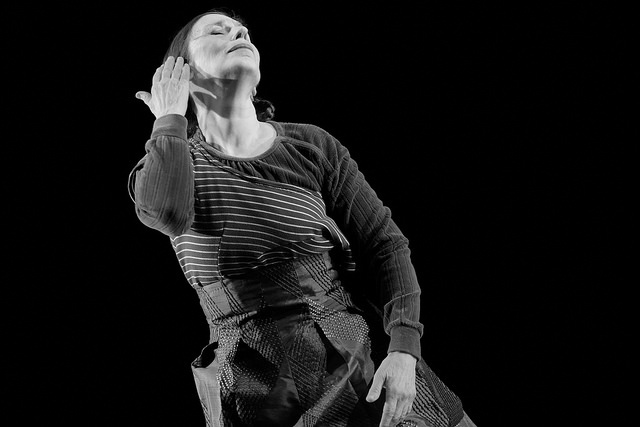 For a long time, vocal genius, movement economist and visionary, Meredith Monk has had one foot in a very ancient past and one foot in a very now future. While this expansive reach could cause a neurosis in some artists, it makes Monk whole and refreshingly authentic. With “On Behalf of Nature” she attempts to speak for nature by creating an “ecological art” that she says wouldn’t “create more waste in the world” — hard to imagine since her work has always been minimalistic. But, she does just that, efficiently using three talented musicians and their instruments as part of the set and interchangeably as part of the performers, increasing or decreasing the five vocalists to eight and back again. The rest of this stark set is handsomely painted by Elaine Buckholtz’s rich sweeps of saturated lighting that turns the stage floor the color of periwinkle or butterscotch, and adds another level of richness to Yoshio Yarbara’s recycled costumes. Yarbara’s ecological designs come from remnants of the ensembles personal wardrobe, which she reconstructs into new and somewhat peasant-like silhouettes. To this simplicity the ensemble creates sound and gestural movement inspired by the random patterns and repetitious movements in nature–like waves and the migration of birds—barrowing upon the chants and choruses of insects, the buzz of bees and orchestration of crickets. They achieve this visual-audio language without cliché mysteriously leading one deeper into a minimalist dream and through the silent spaces of a meditation. “On Behalf of Nature” abides in a transcendent space; a space it generates itself and defends in silence before filling it with its own creations and reinterpretations of nature. Vocalists mouth inaudible words that are as clearly felt and Ellen Fisher–like Monk–has a contained lyrical movement style that is unique onto her. Fisher’s long time collaboration with Monk produces a tangible symbiosis between the two, while percussionist John Hollenbeck transforms the marimba into an alchemical instrument that also recreates the same organic clamor as the vocalists. To break this stream of conscious meandering, or to translate it into another medium, a black and white film montage takes over the stage as the ensemble disappears for a costume change. Grainy time-lapse photography of nature’s constant movement, expansion, and contraction is seen as sprouting fern fronds, amoebas dancing in a Petri dish, or the repetition of waves mixed with the manmade expressions of things like a Chinese New Year parade or the launching of missiles. When the vocalists return all dressed in white they eventually move the dance to where it started and in unison walk up to a precipice of light. At this edge their gestures extend into the light like those elbow to wrist movements made in an offering, before they recede into nature’s black void and are swallowed by the stage.